This is part 2 of my homemade cleaning products discussion. I've seen a lot of cleaning tips that combine many products together to clean hard water or the grime along the edge of the faucet. The truth is, all you really need is vinegar. Vinegar is a real wonder cleaner. I was pretty amazed when it worked! The real power of vinegar, however, is as a spray cleaner. Mix equal parts vinegar and water and go to town. Of course, if you do that, someone will walk in to your home and wonder who spilled vinegar all over. This is why there are so many recipes to make your vinegar cleaner scented. Typically, this process takes about two weeks. 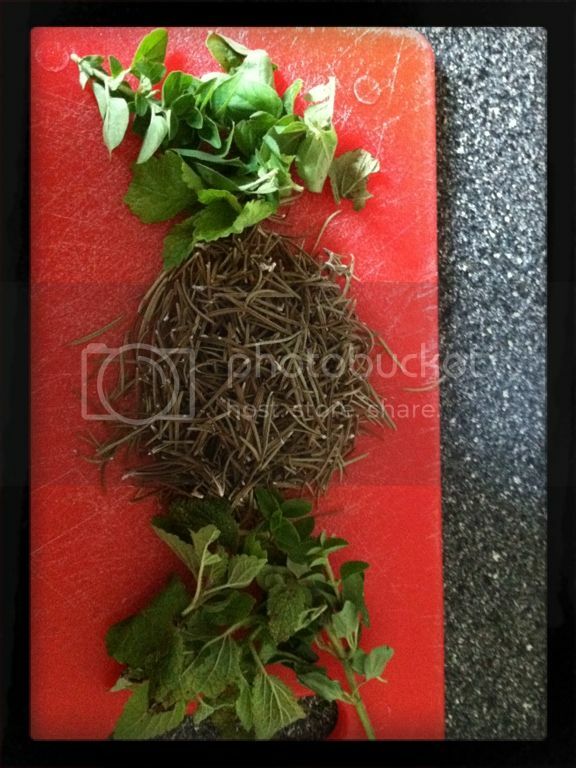 I have all sorts of yummy herbs growing in my garden and my neighbor's garden. For the first round, I opted to use rosemary and lemon balm. Lemon balm smells AMAZING, btw. I placed them in a jar with the vinegar. Shake the jar every few days and when it's done strain it into a spray bottle and add an equal amount of water. That's it! Ready to use. I made another batch recently where I used all my old citrus peals. . . and it will be a lovely lemon scented cleaner. And it cleans so much! It's crazy. For example, you can soak a paper towel in it, the wrap the towel around the base of your sink faucet (you know, the area where you usually have to use a toothbrush or small scrubbie to reach). Leave it for an hour. When you come back, just use the paper towel to wipe up the area and all that grime stuff is gone! I decided to see if it would make the burner rings on my gas stove sparkly again. Vinegar is a wonder cleaner! Thanks for the great tutorial, I need to do this. Citrus sounds nice! I'm so glad you came to party at the Back For Seconds Social! Micki!! LOVE this idea!! It must smell wonderful! Another great tip! Thanks so much! 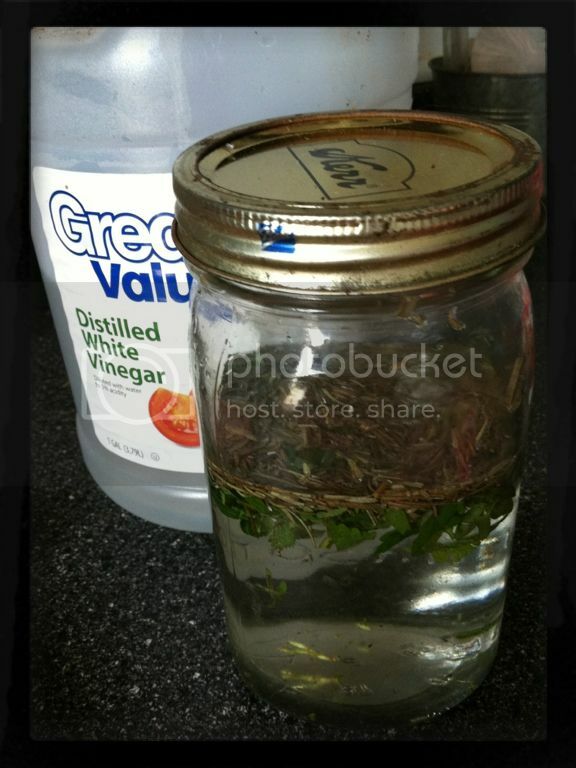 LOVE this, so easy and we always use vinegar for cleaning! I would love for you to share this at Healthy 2day Wednesdays this week up until Saturday evening and also add your other healthy posts each week! I knew vinegar was a good cleaner but that smell! You have solved that problem!!! I've got to give this a try. May have to try this with some lemon or orange peels (no fresh herbs here)if that would work. Vinegar does work great but I can't stand the smell! Thanks so much for the awesome tips! The smell was what always stopped me from using it often. Problem solved! Hope you have a great week! My husband will love you for this! I don't mind the smell when cleaning with vinegar, but he despises it! Thanks! Just a tip: For the rings and grates on your gas stove, the ammonia trick actually works. I tried it and it worked like a charm. (1/4 cup of ammonia in a ziplock-type storage bag, with one grate. Do for each grate and, also, one for the rings. Put them on a baking sheet and leave them outside, in case a bag leaks, overnight. The grime will just about rinse right off. Beautiful). I saw something like this on Pinterest and have had it in the back of my mind to try it for a while. Now I REALLY have to try it. That trick with the sink faucet sounds AMAZING!